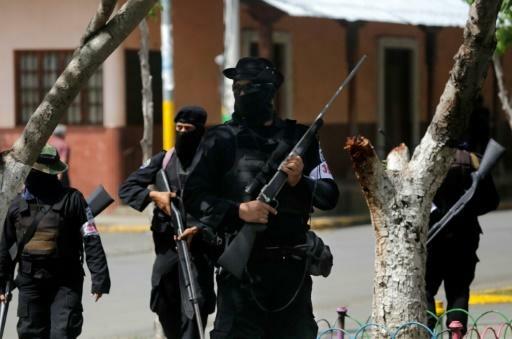 Nicaraguan government forces launched intense raids backed by heavy equipment on Sunday in rebellious towns in the Masaya department, south of the capital, leaving several people injured, a human rights group reported. Residents and rights groups said troops used mechanical shovels in the early hours of the day to clear barricades in at least three towns, in the latest unrest convulsing the Central American country. "They are going to destroy Masaya, it is absolutely surrounded," Vilma Nunez, president of the Nicaraguan Center for Human Rights (CENIDH), told AFP. "We are being attacked by the National Police and paramilitaries armed with AK-47s and machine guns in our indigenous neighborhood of Monimbo," said Alvaro Gomez, a resident. "We are resisting with homemade bombs and stones." "The situation is serious," said Alvaro Leiva, secretary of the Nicaraguan Association for Human Rights (ANPDH). "We need to open a corridor to evacuate the wounded." Leiva addressed an urgent call for help to the bishops of the Episcopal Conference, the UN High Commissioner for Human Rights and the Inter-American Commission on Human Rights (IACHR). IACHR chief Paulo Abrao said on Twitter that he was aware of "the violent repression of towns in Masaya." The government, he added, seemed to be "ignoring the dialogue" with the opposition. The semi-official website El 19 Digital said that government forces had "liberated" the town of Niquinohomo as part of a "clean-up operation" in several southern towns, including Monimbo. The latest violence came a day after some 200 students, besieged by pro-government forces for 20 hours in a parish church in Managua next to the National Autonomous University of Nicaragua (UNAN), were finally allowed to leave following the intercession of Catholic bishops. The UNAN was a last bastion of student resistance. "They were shooting to kill," said one young man. "It was very hard." That operation, which saw students and a few journalists huddling on the floor of the church as bullets whizzed around the building, left two people dead and 14 injured, church officials said. The bishops' conference, which has been trying to mediate between the two sides, issued a statement late Saturday accusing the government of refusing to "dialogue sincerely and look for real processes that lead us toward a true democracy." The bishops have called on the government, among other things, to move up scheduled elections from 2021 to 2019, but Ortega has rejected that idea. Protesters want him and his wife, Vice President Rosario Murillo, to resign, accusing the two of corruption and despotism.